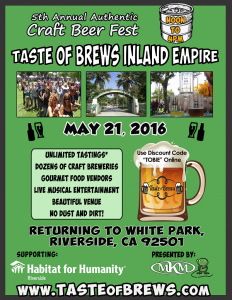 More than a dozen Inland Empire breweries will represent the region — along with more than 20 other breweries (and cideries) from across Southern California and beyond — are scheduled to be busy pouring at the Taste of Brews Inland Empire in downtown Riverside on Saturday (May 21). The event, set for noon to 4 p.m., is returning to White Park, 3901 Market St., for its fifth iteration. General admission tickets are $40 (plus a $3.19 service fee if purchased online) for noon admission and $30 (plus a $2.64 service fee if purchased online) for admission at 1 p.m. Group discounts are available. Tickets include unlimited four-ounce tastes, and access to live entertainment and food for purchase. 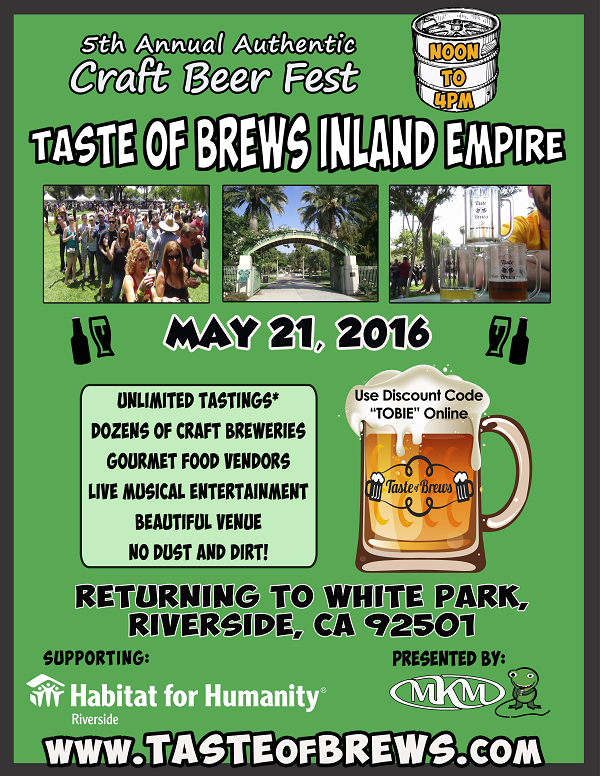 Proceeds from the event will benefit Habitat for Humanity Riverside.